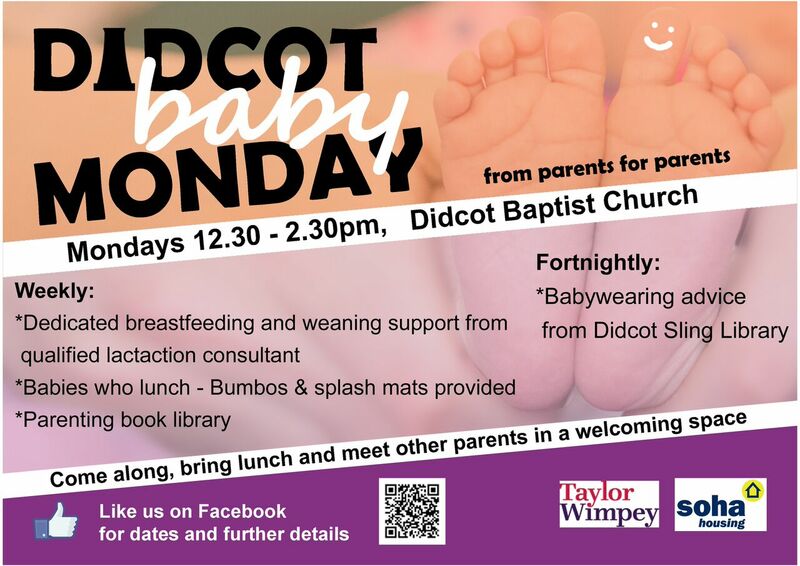 Didcot Baby Monday is run by volunteers and like minded parents welcoming all parents and those caring for babies and young children from Didcot and surrounding areas. We strive to be an inclusive community base providing up to date information and support, promoting gentle and attachment parenting and respecting all parenting choices. @ Didcot Baptist Church weekly, car parking, bus stop and rail station within walking distance. Ground floor meeting room and easy access. Dedicated nappy change room. Baby toys and clean, soft play-mats are provided for babies. Hot drinks (in lidded cups) and biscuits or home made cake are available at every session. The suggested donation is £1/week per adult but this is a voluntary donation and entry is free. You are welcome to bring your own lunch, we provide Bumbos and splash mats for babies on solid food. We have a Lactation Consultant (IBCLC) at every weekly session to provide baby feeding information and support plus a trained Babywearing Consultant and sling library every other week. Local NHS Midwives, Health Visitors and our Lactation Consultant run a monthly antenatal baby feeding talk, which all expectant parents and their supporters are welcome to join. Sling library provided once month by Didcot Sling Library. Parenting book library covering a wide range of topics. We look forward to welcoming you!